MCP16331 INV click works as a buck-boost voltage regulator, a switching regulator topology that combines principles of the buck conversion (step-down) and the boost conversion (step-up). A buck converter outputs voltage that is smaller than the input voltage (steps down the input voltage). A boost converter outputs voltage that is greater than the input voltage (steps up the input voltage). By combining these two topologies, MCP16331 INV click is able to output a regulated DC voltage, which can be set in the code, for input voltage both greater and less than the output voltage. A major difference between the MCP16331 INV click and another click with the same name - MCP16331 click, is that this click works in an inverting configuration, providing an output voltage which is negative in respect to the GND level. Negative voltage is often used in symmetrical power supply configurations - for powering up operational amplifiers and similar devices that require such type of power supply. This feature, as well as the excellent power switching efficiency, overtemperature protection, and a clean regulated voltage output makes this device an ideal solution for powering up any application that demands a negative voltage power supply. The switching regulator used on MCP16331 INV click is the MCP16331, a step-down (buck) switching regulator from Microchip. 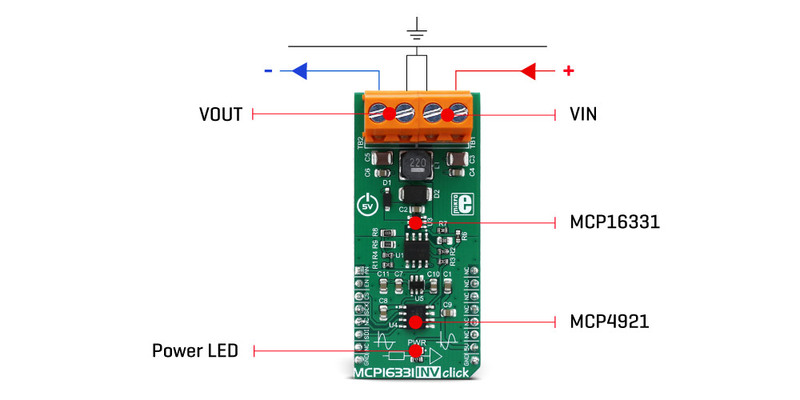 However, with the help of a few external components, MCP16331 INV click is able to regulate voltage levels both lower and higher than the input voltage, working as an inverted boost-buck voltage regulator. The MCP16331 INV click is designed so that it can output a negative voltage, with respect to the GND. A negative voltage is often used in the analog electronics domain, to power up devices which require both positive and negative voltages to be applied. A good example would be an operational amplifier (opamp) which amplifies an AC signal. The signal goes in both positive and negative direction with respect to the GND. Processing this kind of signal with using just a single voltage source is difficult and requires workarounds such as using capacitors, charge pumps and virtual GNDs. Using a symmetrical power supply reduces the number of required components and simplifies the design. To be able to deliver a negative voltage, several additional components, such as the ADM8828 voltage inverter IC and the LM318, a dual operational amplifier have to be added. The ADM8828 voltage inverter IC is used to provide a negative component of the symmetrical power supply, used for the LM318 dual opamp. One integrated opamp from the LM318 IC is used to invert the output from the DAC. The other opamp from the LM318 IC is used to invert the output from the voltage divider, located on the output rail of the MCP16331 so that it can be used by the MCU, which uses a single voltage power source. To set the output voltage of the MCP16331 INV click, the MCP4921 - a low power 12-Bit dual voltage output DAC is used in the feedback loop. As already mentioned, it is necessary to invert this signal as the MCP4921 is supplied from a single voltage power supply, and it is not capable of bringing the signal lower than the GND. Since MCP16331 works in the negative voltage domain, the feedback voltage applied to the FB pin of this IC also needs to be negative with respect to the GND. One of the LM318's integrated opamps, configured as a unity gain inverter, is used to invert the DAC output voltage. Since the FB pin of the MCP16331 IC is driven by the DAC, it is enough to set the DAC to a specific value, in order to control the output voltage of the click board™. Communication with the MCP4921 DAC is done via the SPI interface. SPI bus pins of the MCP4921 are routed to the mikroBUS™ for an easy and secure connection with the host MCU. The AN pin of the mikroBUS™ is routed to a middle point of a voltage divider at the output. This voltage divider is used to scale down the output voltage so it can be successfully converted by the ADC of the host MCU. The voltage on the divider also has to be inverted, since it is coming out from the negative voltage domain. This is achieved by the second operational amplifier of the LM318 IC, which also works as a unity gain inverter. This value can be used to monitor the output voltage and correct it, if needed. The EN pin of the MCP16331 switching regulator is routed to the mikroBUS™ RST pin. By pulling this pin to a HIGH logic level, the internal sections of the regulator are enabled. The EN pin is internally pulled to a HIGH logic level, so the device will be enabled, even if this pin is left floating. Therefore, a correct startup sequence must be used, in order to avoid undesirable effects (in the NOTE, below). Although it is designed to work as the negative power supply, MCP16331INV click can also be used to drive a regular load, connecting its positive input terminal to the GND of the click board™, and using the negative output of the MCP16331INV click as the GND. The reason for this sequence is that the enable pin (EN) of the MCP16331 has an internal pull-up resistor which keeps the MCP16331 output stage enabled at all times, even if the pin is left unconnected. Having an undetermined voltage output at the DAC during the startup sequence might result with unwanted voltage levels at the output terminal. Libraries, provided with the MCP16331 INV click, will allow for simple and effortless setup of the necessary parameters. The included demo application can be used as a reference for future designs, and it demonstrates the functionality of the click board™, as well as the included software libraries. Applications Negative voltage is often used in symmetrical power supply configuration for powering up operational amplifiers and similar devices that require such type of power supply.